The 2010 TransWisconsin bike packing trip/race. 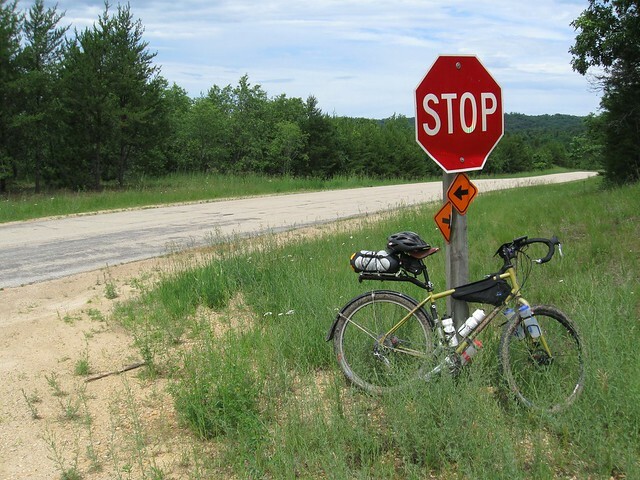 My experience coming into the event was a couple of S24O’s on a different bike, as well as some fully loaded touring with a Surly Long Haul Trucker a few years prior. The bike itself is a size L Salsa Fargo with XT. The changes I made were swapping the stock post and seat for Thomson setback/Brooks B17 combo, and swapping out the stock Vulpines for Nanoraptors. I also added two more water bottle cages on the fork, but kept the bottles empty unless I thought I’d need a lot of water. Knowing we would be on a lot of gravel, I opted to leave the rear fender on assuming I would be riding in the rain somewhere along the route. I really had no idea what was needed for an event like this. I knew I could endure a certain level of “going without”, but I wanted to also have all of the pieces/parts with me to be able to successfully finish the event. I knew there would be opportunities to stop for food, but bike shops would be few and far between. 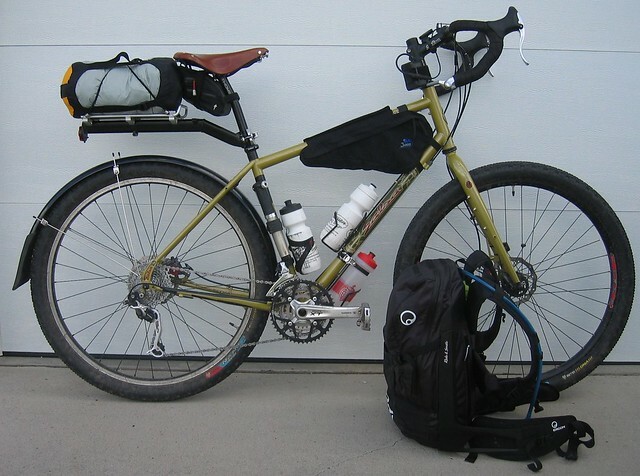 I arrived at this configuration after a lot of reading here, MTBR and various TourDivide blogs and reports. Some things worked out good, others not so well. Although I didn’t finish the event, I learned a lot in the process I am incorporating that into a V2 version for another attempt at finishing the route in 2012. Drop the soap and towel for baby wipes. Drop the rainpants and windbreaker for a wind vest and arm warmers. Take more food with me on the bike. Having food at all times = freedom. Swap the hammock for a bilgy tarptent or a bivy/tarp combo. Ease of setup when tired and it’s dark is paramount. The hammock was a bit too tough to find a hanging spot for. Salvaged Tyvek/housewrap ground cloth was extremely noisy too. Frame and seat bags vs rack and backpack. Weight will stay lower and off my back/hips. The BC3 is a nice pack, but I ended up with a lot of stuff in it, and all of that weight ended up on my hips and shoulders. The rack itself weighed at least a pound. Adding aerobars for another riding position and a place to hang tent/sleeping bag. Cook kit. Even in Wisconsin, I wasn’t guaranteed that food was going to be close to the route. I ate breakfast every morning before leaving camp. Those few minutes were a good time to write my thoughts down in a notebook and prepare for the day. It was all cooked with a supercat stove. I will drop the pot and just cook in the cop, although heating water for coffee while eating was handy. gives the desired warm-up a lot of times w/o creating a sweat bath. For the four days I rode, there was a wide variety of conditions. Day 1 was a lot of chipseal and gravel. Day 2 and 3 were mixes of chipseal, gravel, singletrack and sand (on day 3). Day 4 was gravel, fire road, and a lot of rain. As far as putting stuff on my legs, I would have no issues stopping for a minute to snag something out of my bag to stay warm. One way to quiet the tyvek is to run it through the washing machine without any soap. It makes most of the crinkly sounds go away. Nice set up though. My list of “things that work versus things that didn’t” looks very similar! I had the same problem with the hammock hanging many times this summer. The weight/pack size is great for light travel, but even in the presence of plenty of trees (which judging by the pictures I have seen from TW there wasn’t a shortage) finding two trees properly spaced can be frustrating. A few times I just used it as a ground cloth. BTW, the Aero bars on the new setup are pretty boss. Your panoramic photos are great. I like the vegetable garden. To clarify my vague rambling: If you delete your rain pants for arm warmers and a vest, and you delete your leg warmers, then it would seem like the only way to warm your legs if weather conditions got nasty would be to stop and climb into your sleeping bag. Likewise, rainpaints are sort of a bug control countermeasure of last resort. I did a little digging on this event and it looks really neat. I passed through some of the nearby country on a cross-country drive a long time ago. Best luck for your next venture! Jeff – Thanks for the comment. I have some friends that swear by the Wingnut packs. For this first trip, I went with the Ergon more for volume than anything. It held everything but my sleep system which was on that rear rack. I’ve been working on switching over to a frame bag system this winter. With some new and used frame bag and sling purchases, I’m in a spot where a Wingnut would probably fit the bill nicely. I wanted to add that I took Bart’s advice and ran the tyvek through our washer with a bunch of jeans and other bulky stuff, sans soap. Two cycles and the tyvek was a LOT softer and a lot quieter. I slept on it this weekend with a sunshield on top of it and had no noise issues. On the hammock: swap out for longer tree straps. I use 10′ straps and the Whoopie slings which allows me to get to bigger & wider apart trees. I’ll bring a bivy also if I think there will be times I can’t hang. The bivy & the hammock’s tarp then can be used. I like keeping my options open. at_hiker – Thanks for the suggestion. Longer slings are on the list. Right now, I’m on a bit of a tarp/bivy kick. I’m hoping to get out this fall for a bit of hammock camping. I think just getting out more will get me more comfortable with the options.